Fox news has a good opinion piece by Judith Curry on the recent call by 20 fake scientists for criminalization of activities by people and organizations who can still objectively read a graph which shows climate models are complete failures. Advocates like to say that these graphs are unfair due to baselining, then those same advocates publish work which uses the confidence interval of an absolute temperature at a single point to claim they are in the bottom edge of the CI rather than the model trend which has failed miserably. In other words, they are gaming the plot to maximize their match and intentionally ignoring the elephant in the room. Some of these papers have even gone through the fake peer review processes and reached publication. It is truly a shame that climate science has stooped to this level. In the meantime, those of us with the now criminal skill to read a graph and objectively interpret it, have been told we should be forced surrender our assets and be sent to prison by the always tolerant liberal left. 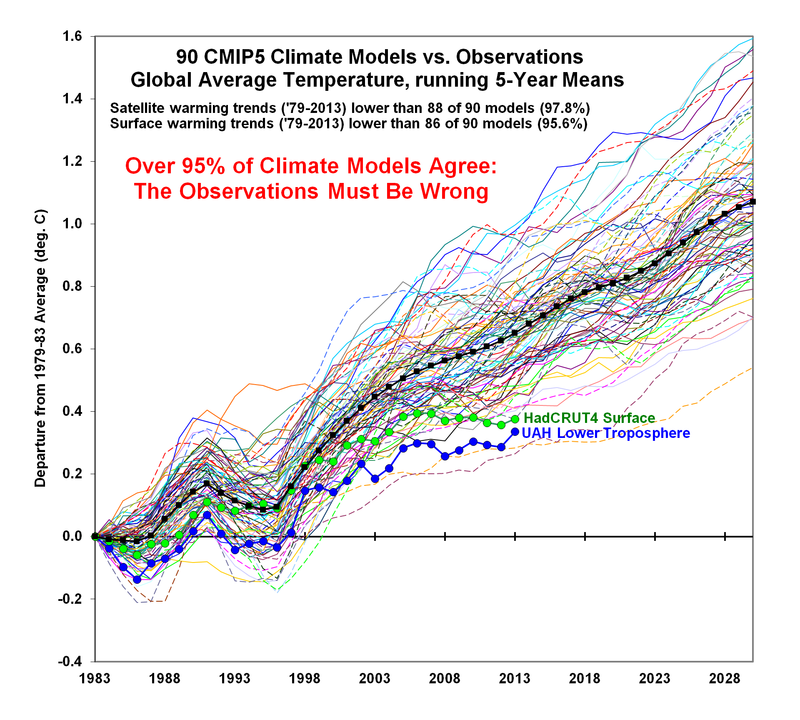 The models failed en masse and anyone who claims otherwise is simply pretending to know science and acting as a political advocate. But where would punishment of skeptics be without religious involvement. Skeptics have been accused of Galileo syndrome, I found it particularly ironic that the pope himself went to US congress to repeat these same sorts of establishment climate science falsehoods just last week. Like Germans with politics, Catholic leaders seem to work hard to continue to maintain their dismal scientific record. Trenberth – (edited) Skeptics need to shut up or be shot. Judith Curry called attention to a fairly important event in climate science. A number of scientists are calling for the government to prosecute criminally, corporations and individuals who will not agree with the extrapolated gloom and doom conclusions by fake scientists who base their opinions on failed climate models. These fake government funded scientists have written a letter asking for the senate to use RICO law as a mechanism to prosecute normal scientists, institutions and businesses who won’t agree with their draconian, self-destructive behaviors. The Racketeer Influenced and Corrupt Organizations Act, commonly referred to as the RICO Act or simply RICO, is a United States federal law that provides for extended criminal penalties and a civil cause of action for acts performed as part of an ongoing criminal organization. The RICO Act focuses specifically on racketeering, and it allows the leaders of a syndicate to be tried for the crimes which they ordered others to do or assisted them, closing a perceived loophole that allowed a person who instructed someone else to, for example, murder, to be exempt from the trial because he did not actually commit the crime personally. RICO was enacted by section 901(a) of the Organized Crime Control Act of 1970 While its original use in the 1970s was to prosecute the Mafia as well as others who were actively engaged in organized crime, its later application has been more widespread. As you know, an overwhelming majority of climate scientists are convinced about the potentially serious adverse effects of human-induced climate change on human health, agriculture, and biodiversity. We applaud your efforts to regulate emissions and the other steps you are taking. Nonetheless, as climate scientists we are exceedingly concerned that America’s response to climate change – indeed, the world’s response to climate change – is insufficient. The risks posed by climate change, including increasing extreme weather events, rising sea levels, and increasing ocean acidity – and potential strategies for addressing them – are detailed in the Third National Climate Assessment (2014), Climate Change Impacts in the United States. The stability of the Earth’s climate over the past ten thousand years contributed to the growth of agriculture and therefore, a thriving human civilization. We are now at high risk of seriously destabilizing the Earth’s climate and irreparably harming people around the world, especially the world’s poorest people. The methods of these organizations are quite similar to those used earlier by the tobacco industry. A RICO investigation (1999 to 2006) played an important role in stopping the tobacco industry from continuing to deceive the American people about the dangers of smoking. If corporations in the fossil fuel industry and their supporters are guilty of the misdeeds that have been documented in books and journal articles, it is imperative that these misdeeds be stopped as soon as possible so that America and the world can get on with the critically important business of finding effective ways to restabilize the Earth’s climate, before even more lasting damage is done. Every name on this list is essentially a modern day Nazi. These are evil people who have no idea the damage they do NOR DO THEY CARE. They are small minded morons who think with their feelings instead of their minds. This is a blatant call for the might of government to suppress not only free speech but correct speech. I and others have written this so many times but it seems that people never learn. When you vote for more government, you give up your choices for personal rational decision making, in favor of loss of personal freedom. The corporations, organizations and ultimately individuals, whom are all already under numerous forms of government attack, will continue to be forced into compliance and will be rewarded financially if they capitulate. The carrot and stick are both in full visibility. In exchange, the liberal politicians collect money in the form of personal campaign contributions, business favors, and new politically controlled ‘problems’ to discuss on the political trail. This mechanism extends through both parties but primarily exists in the democrat party as they are able to OPENLY demand more government whereas faux conservatives must pretend to not notice the governmental creep. I’ve written it before, and will continue to write it again as we come closer to a serious election cycle. Judith (and plenty of other people) deserves what she gets because she was duped into voting for it. I just hope that people wake up and realize that we already have far too much government for our small population before we lose the last pieces of our freedom as we slide into the ugly morass of socialism. It is late in the game though for America, and pseudo-intellectuals like the moronic signators on this letter deserve to go down first. In fact, loss of their government jobs is what they deserve for suggesting using a legal loophole for the unconstitutional suppression of reasoned dissent. Of course they will continue to receive that same government money as they nearly all have university jobs from which they cannot be fired. They can rest comfortably knowing that it won’t be any of them who suffers the consequences of their economic ignorance. These same fools have been predicting starvation and doom from population growth for decades. When we suddenly have starvation again, you can bet the same morons who are currently demanding by legal fiat, that we create intentional economic productivity loss to save humanity, will then blame the very thing they intentionally destroyed for the problems the destruction creates. The industry which would have otherwise fed them, saved them from war, helped their children grow and learn, provide world class health care, gave them homes and leisure time beyond imagination — free market businesses built by individuals and optimized for best output — will be a shell of its former self. The reality will be that socialism and the high load of massive government will have been the cause, they will have the power, control of the media, and the universities, and through those mechanisms free market will continue to be assigned the blame. In 2008 I started this blog after looking at the nonsensical political intentions of global warming activists. I knew full well before I began, that even if global warming were as dangerous as they claimed, the alarmists socialist solutions were a far more immediate danger than anything we could do to the environment. I knew that I would let science drive my own solutions, no matter the direction it took me, but socialism is only a solution to success. I have learned more than expected about climate science and I am more disappointed in the science than I ever imagined possible. Taken as a whole global warming is simply not science. The field of climate study is so severely polluted that I cannot even read a paper on oceanic acidification without a jaundiced eye. The money, the political money, and corresponding pressures from big government, the printed, fake, borrowed, stolen, redistributed money is far too great for any science to overcome. 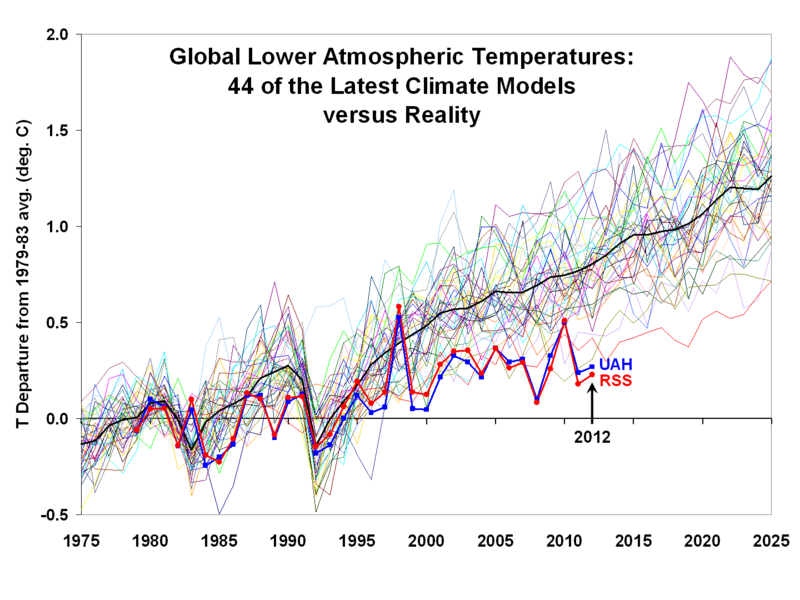 Climate models do not match observation — tell that to Bart Verheggan and watch the fireworks fly — they do not match, they have failed and no amount of left-wing sophistry can help them. That does not even slow the rampant decision making by our government. No amount of common sense deters the power mad or the good feeling scientists. It’s all about limitation, all about reservation, and it is falsely labeled as progressive. As I write this, America is literally shutting down its primary energy production with no replacements intended. We do this on the basis of an imagined problem, which can already be proven did not happen. Scientifically proven to not match models. The problems of warming DID NOT happen, yet we are destroying – literallly – the energy releasing devices which gave us freedom from poverty, sickness and oppression of numerous dictatorships. Coal powerplants have been regulated out of existence and it is under one year before demolitions begin. These plants must be not only deactivated or idled in case of need, but slaughtered into dust, such that property taxes aren’t paid on unused buildings and equipment. Machines, technologies and equipment that took us centuries to build, that have no replacement coming in the near future, destroyed and pounded into dust to make idiots “feel better” about trees which ironically eat the same output gas we are eliminating production of. When you are cold, poor, unemployed and impoverished in only FIVE years, will you reach your feeble hand out to the government for the pittances they will offer. Will you accept their checks to “support” you, as we slide ever further into the poverty socialism offers. My answer is yes, yes you will. We have added tens of millions to those very roles in only the last 6 years of Obama socialism. You are reading here so you are probably not one of the currently impoverished as free computers are not yet part of the government handouts. When it comes time, you will have hands out, begging for help from the very people who caused the problem. People you may have voted for, perhaps even to save the planet from the fabricated threat of a tiny bit of warming. Except that you didn’t vote for the rules themselves because nobody did. Our government is so big, so powerful, that even the unelected thoroughly leftist EPA is making its own law, its own crimes against the ecosystem, which when we are deemed guilty of we can be punished and our lives ruined for. And as they are unelected morons, NO American vote can change them. These same fools are intentionally destroying the most important thing America has – low cost energy production. Their goal has nothing to do with your economic security, nor are they saving the environment. There is no ‘renewable energy solution’ in existence. What is worse, there NEVER will be. We use too much power today for exaggerated science of ‘renewable energy’ to actually solve the problem. In the future we will need dramatically more energy, not less. Renewable in today’s terms means incident solar power or geothermal and our required energy needs cannot be rationally met that way. It is a pipe dream which will not exist. Nuclear can solve the problem, as can gas, oil and coal while we continue to improve our nuclear technology. Solar, wind, biofuel, geothermal, can never do it. They WILL never do it. The watts don’t exist in the required density, nor does the technology. I’m just an engineer so you should listen to your stupid green feelings instead, or perhaps that know-nothing jorunalist with a big smile who looks great in a short skirt or whatever you like. I will just continue to see you as a moron until you change your mind and you will then achieve the prestigious label of one of Id’s previously ignorant. Of course we can pretend. We can try to feel good while wrecking balls crash through our fully operational and very clean, perfectly functional powerplants next April. The lack of smog and brown skies in one of the highest energy producing countries on the planet are proof of their cleanliness. Of course if it makes you feel bad, we should recycle the remains of the power plants, throw some topsoil on their now green carcasses, fill in a few mines with water and fish and plant some trees. I am thoroughly pissed off that America would even consider this, let alone let it happen. I’m so beyond scared for our children when we turn off their heat and lights on f…ing purpose and tell them that “conservation” can replace usage, it is difficult to describe. While I want to say this is only a symptom of the obviously bigger problem, it is like saying your leg fell off is a symptom of gangrene. The single most abundant factor in this universe is energy, and even Einstein can’t teach us to use it. We deserve the monkey-like herd deaths which will come, because as a population we are NOT smart enough to deserve the gifts the energy rich universe gives us. When suddenly the environmentalists proclamations that we will not be able to feed ourselves become true, because of our growing population, it won’t be for any other reason than that we adopted limitation of progress as a ‘progressive’ policy. We have stayed ahead of their wildest imaginations with respect to food output, in large part due to availability of cheap energy. While they sound smart sometimes, none of these limitation folk are smart enough to attach their own actions to the cause, and considering millions of years of evolution it took to get us here, when we reach the point of starvation, they won’t be any smarter about cause and effect than they are right now. History has demonstrated that the left will literally starve us en-masse, as Chavez did, as so many socialists have done to their populations. Examples are across the globe. It didn’t stop Hollywood from actually making a movie to actually celebrate Chavez! Socialism is still good!, and Chavez is a hero to the now starving, sick, broke, dying, powerless and impoverished people of a once nearly functional society but he isn’t the cause, he is the hero??!! They will continue to preach to us the benefits of central control while our children starve in the streets. We will die by the hundreds of thousands, and we will stick our hands out for the food lines, for the medicine lines, for the government chits, whatever brand of paper they conjure. Yet die we will. And we earned it, because we allegedly want to try and prevent our sub-fraction of a couple of degrees Celsius warmer weather– which we will ironically fail at. We need coal for several more decades or at least until we fully implement something else. That we can even imagine shutting it off cold, is a sign of failed minds. If you ever wonder what the UN, IPCC and Climate Science ™ are truly about. Naomi Klein has your answer. While some falsely claim that 97% of climate scientist alarmists agree with global warming doom, the reality is that the most powerful of those people believe in ending capitalism and embracing socialism. There has always been this tendency in humanity to reject what is obviously true and embrace insane ideas, e.g. killing people for Allah or Christianity is just as bad as Muslim. While both religions have bad history, taken objectively neither of these are reasonable opinions to hold. Yet those are deeply engrained in today’s popular and insane culture. The acceptance of nonsensical ideology is front and center in the case of capitalism vs socialism and communism. Every evidence of greater comfort, cleaner society, better quality of life, reduced poverty is fully in view in capitalist society, yet the public actually pays money to listen to ignorant fools prattle on about the benefits of central control and the need to destroy the very industry they rely on. To these fools extreme poverty and human suffering so evident in Cuba, Venezuela, Russia, on and on, can all be cured if we just imagine the good people in control. It’s like a war on air. We need air, but we feel it is bad so lets get rid of it!! From the idiot pope, the majority of media, to morons like Naomi, people are screaming for less production – so they can personally have more stuff and less poverty. These people are literally that stupid. And there are a lot of them out there. I can’t pretend to understand how people get to that level of ignorance, but when Hillary and Bill Clinton are caught peddling US government influence to funnel money from foreign countries into their own “non-profit” company, it doesn’t prevent people from thinking that somehow she’s one of the good ones so that is what we should have for president. Bernie Sanders pounding on about the evil rich and how his own version of robin hood where everyone gets free college paid for by everyone else. He completely misses the point that much of the population isn’t smart enough to need college. It is simply of no use to them. You can’t teach them to be smarter but you could make them less ignorant. Today’s public universities are so polluted with liberal activist professors it is nearly impossible for any rational teaching to be done anyway, perhaps that is his real goal. These once good schools have become left-wing indoctrination farms. Ignorance has therefore become a key component of their curriculum. Students are often forced to repeat the nonsense knowing it will help their grades until it becomes part of their own thought patterns. In case you are one of the confused ignorant morons, there are plenty of ways to get through college and stealing from productive people to give to non-productive people is not a plan for societal success. Climate science is often compared to a religion these days. In the same way that Muslims can believe in an invisible man who will make them personally better off if they kill other people, alarmists posing as scientists believe that somehow stopping production will lead to a green nirvana. Better living will come if we simply stop working to make our lives better. If we prevent companies from improving efficiency, or delivering services at lower cost, we will all have more and the world will be better for all of us. There is no more evidence for that than there is for Allah’s favor in return for murder, but believe they do and since it is an irrational non-evidentiary belief, you can’t negotiate with them logically. That is what climate science is. Left-wing radicals lying about dangers because they have a single poorly concealed goal in mind based on a projected future which cannot physically exist. Naomi knows best. Were that goal in any way rational, it might be a good thing, but their barely concealed goal is completely irrational and dangerously so from a societal standpoint. That is why despite the shrill alarmism in the media and from the IPCC, there is not one single actual danger from warming that has been discovered. No increased hurricanes, no dangerous sea level rise, no tornadoes, droughts, rainfall, extreme melting of glaciers, no extinctions, on and on. Despite what you keep being told in the media, these things didn’t happen due to global man made climate change and many didn’t happen at all. That is why even though climate models have failed completely, the “scientists” cannot admit that failure even while simultaneously trying to fix the ostensibly non-existent problems. That is why we get nonsensical “scientific” papers that conclude fish are shrinking, sheep are shrinking, pretty little butterflies passing away from heat stroke, and Antarctica is melting — these are all lies. Flat lies, although I’m sure some of the irrational climate alarmists are crazy enough to believe their own nonsense. The result of this ignorance is purely evil. Peoples lives are already being destroyed by crazy regulations brought about by the same alarmist groups for the same purpose. It is actually become quite a common problem across the world. Yet people are lining up for more socialism, more regulation, less production, higher taxation so they can personally have more….